The most romantic place I've ever visited is Venice, Italy. When you get off the train, walk through the station, and open the doors, it’s like stepping into a fairy tale. The streets are all canals, and ornate ancient bridges span the canals, including the famous Bridge of Sighs, where prisoners gazed upon the city for the last time on their way to be locked up. 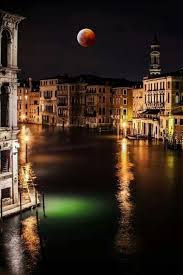 On our last trip to Venice, I planned the trip to coincide with the full moon. When darkness fell, my husband and I had dinner and walked around. No moon yet. We stopped at a café and had gelato and cappuccino. No moon yet. We crossed a bridge and strolled some more. Still no moon. Finally, at 11:30, it rose, glowing and sending shimmering moonbeams over the canals. So I hadn’t figured what time that full moon was supposed to appear! Read all about Venice here.